As the season winds down, for the teams who are sitting at the bottom of the pack, its do or die. Last night’s contest was just this for Vancouver as they are sitting last in the West at 4-11 while Saskatchewan has now clinched their playoff spot and moved into second in the West with a record of 7-6. Even with a change of venue, new ownership and new management the woes continue for a struggling Warriors team. They have the offense, they have the defense, but they don’t have the most important piece of the puzzle…a winning record. 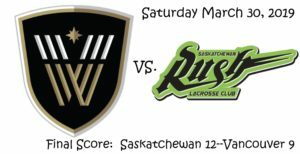 The Rush would outscore the Warriors 10-2 in the first half, and even though the tables turned in favor of Vancouver in the second half outscoring Saskatchewan 7-2, it would not be enough as the Warriors would suffer their 11th loss of the season. Final Score: Saskatchewan 12—Vancouver 9. Robert Church (4G, 3A) would start it off for Saskatchewan at 3:01 top right on the screen to get the Rush on the board. Vancouver’s only goal in the frame would come on the man-up off the Nik Bilic boarding call during a scuffle behind the cage. Keegan Bal (3G, 2A) would get his 19th goal of the year and 50th point as he found the back of the net under the glove of Shute on point to tie it up. That would be it for Vancouver as the Rush would control the game for the next 18 minutes scoring seven unanswered goals. Church would put up two more, the first on the rebound tip toeing the crease with a couple pump fakes on the door step at 6:06. Ryan Keenan would hit back-to-back, at 7:05 he would head strong to the crease, survey the defense and with a little jump, hit far side. At the 11:47 mark, the wheels fell off of the Vancouver defense as they would be nabbed with back-to-back-to-back penalties. Starting it off, a delay of game at 11:47; roughing at 12:09; and an illegal cross check at 13:28. For the remaining three minutes and 15 seconds, the Rush would be on man up situations and would capitalize on two of three. Keenan would get the BTB pass and go low on the bounce between the five-hole at 11:57; and Church would get his hat-trick on the man-advantage when Mark Matthews (1G, 7A) faked the BTB shot and passed to Church to close out the first for Saskatchewan off the cross field pass hitting top right off the screen at 12:19. Shots on goal: Rush 20—Warriors 6. Score at the end of one: Saskatchewan 5—Vancouver 1. Vancouver’s problems would continue into the second. Matthews would continue the run for Saskatchewan up the middle with a shot that was deflected but still found its way to net stick side at 2:38. The Rush scoring would continue as Ben McIntosh (2G) would take a huge hit on the outside as he tiptoed the crease diving short side on Penney between the five hole at 6:21 putting the Rush up 7-1; and Jeff Shattler (3G, 1) would step into the shot far side bottom left at 7:09 sending Penney to the bench. Backup net-minder Aaron Bold headed to the cage for the Warriors in the hopes that things would change. The run would end with a delayed call on Saskatchewan. Rookie Jean-Luc Chetner would find an opening on the far side and pulled the trigger giving the Warriors their second goal of the game at 7:35 halting the 18 minute scoring drought for Vancouver. But penalties continue to plague the Warriors as they would be hit with their fourth on the night, this time an illegal substitution bench minor and James Rahe, the in-home player would head to the box for two. Once more, the Rush would score by none other than Church hitting top corner for the hat-trick and third power-play goal on the night. Again, the Rush would close out the frame when Shattler got the open lane and buried it five-hole at 12:58. Vancouver was not getting their possessions making it hard to generate any offense, while the Rush were controlling the ball extremely well making quality shots on goal. Vancouver was self-destructing and being hit with senseless penalties. Saskatchewan would still lead in shots on goal 36-17. Score at the end of two: Saskatchewan 10—Vancouver 2. The third quarter looked more like an MMA match than a lacrosse game. There would be a total of nine penalties totaling 43 minutes. There would be four goals as Vancouver would finally find their defense. Had it not been for the boxing matches that seemed to occur more frequently than shots on goal, the Warriors very well may have been able to put more points on the board to close the gap. Fights would come from Bilic and Owen Barker who went to blows after a big hit by Barker on Thompson to the head sending both Bilic and Barker to the showers as each would get hit with five-minute fighting majors; and 1o minute game misconduct penalties. Jeremy Thompson would be next up taking down Zach Porter after the draw as he grabbed Porter around the neck and slammed him to the floor. And the final fisticuffs would come as Logan Schuss fell to the turf causing Kyle Rubisch to trip sending both men to the box for two minute roughing calls. Just before all the mayhem, Logan Schuss (1G, 2A) would start a three goal run for Vancouver with the power move towards the cage and as the was shot checked, the ball would pop out of the stick and trickle over the shoulder of Shute at 6:47. Mitch Jones (2G, 1A) would be next to score on the four-on-four as he came trucking off the bench and shot at the front door stick side high passed Shute at 7:32. They would score once more in the third when Tony Malcom (1G, 2A) would score as he worked his way to the goal with the stutter step far side low over the left shoulder bringing them to within five. Saskatchewan would stop the run and score the final goal in the third off the penalty release, McIntosh would find net over the extended leg of Bold far side at 12:04. Saskatchewan would still lead in shots on goal 45-29. They would hold the lead at the end of three, 11-5 over Vancouver. Vancouver would again control the frame starting if off with Jones doubled team as he fought his way to the cage with a powerful shot that hit inside the cage top corner and out over top starting their four-goal run. The Warriors would see two more from Bal, the first as he fought his way past his defender to squeeze it through the seven-hole at 6:46; and the second on transition off the break after the feed from Goodwin he would jump over the crease, fake left and slam dunk right for his hat-trick at 12:20. Jordan McBride (1G, 2A) would receive the hard pass from Malcom and slam dunk the net coming around backside hitting the wide open net at 11:12. In a last ditch effort to put another on the board, Bold would head to the bench with 58 seconds remaining and in an unfortunate series of events, Shattler would head to the cage with Rahe on the chase and would drive in the dagger. Final Score: Saskatchewan 12—Vancouver 9. Some interesting facts of the game, Vancouver outscored Saskatchewan 7-2 in the last 30 minutes of the game; Adam Shute earns his first home floor win; and the Rush clinch a playoff spot putting them second in the West. Vancouver (4-11) gets the bye-week to regroup and will host the Philadelphia Wings (3-11) on Sunday April 14, game time 6:00 p.m. EST. The Rush (7-6) will head to Colorado to face the Mammoth (6-8) on Saturday April 6, game time 9:00 p.m. EST for LaCrosse Out Cancer Night. The Mammoth are coming off two strong victories against Vancouver and are looking to rebound from an extremely slow start this season.